Pamplin Media Group - Hunt is on for porcelain dragonflies! Hunt is on for porcelain dragonflies! 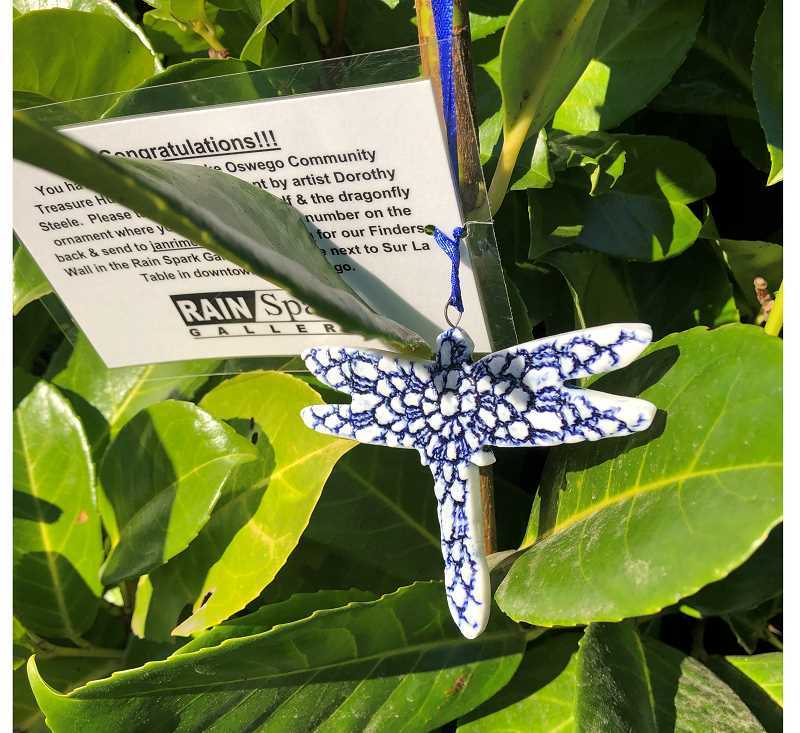 The artists of Rain Spark Gallery have launched the fifth-annual Community Treasure Hunt, with 60 handmade porcelain dragonfly ornaments — signed and numbered by artist Dorothy Steele — now hidden in Lake Oswego businesses and parks. If you find one, it is yours to keep. Clues to the whereabouts of the ornaments are scheduled to be released every day at 4:30 a.m. through Dec. 30 on the Rain Spark Gallery Facebook page. "We have had people rush out in their pajamas to find the ornaments," says artist Jan Rimerman, a gallery organizer. The ornaments are also available for purchase at Rain Spark Gallery, which is located in Lake View Village between Sur la Table and Fleet Feet PDX on A Avenue in downtown Lake Oswego. The gallery showcases the art of 35 local and regional artists, representing all media — including weaving, painting, jewelry, sculpture, ceramics, photography, wood turning and more. Rain Spark hosts wine tastings featuring Tumwater Vineyard's wines each Thursday from 5-7 p.m. Shoppers can also enjoy live music by Spanish guitarist Maria OIaya from 5-7 p.m. on Dec. 13, 21 and 30. The artists will also host a Winter Solstice Party on Dec. 21 and an Early New Year Celebration on Dec. 30. The gallery is open 11 a.m.-7 p.m. Monday through Saturday and 11 a.m.-5 p.m. Sunday through Dec. 30. Learn more online at http://www.rainsparkgallery.com or call 971-294-2042.